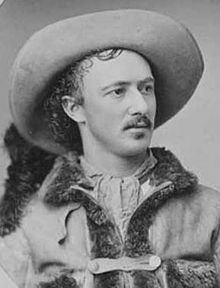 One of the most colorful characters to come out of the Old West was Buffalo Bill. He acquired his nickname after the Civil War, when he was hired to provide meat for the Kansas Pacific Railroad workers. Reportedly, Cody shot 4,280 bison in 18 months. William Frederick Cody (February 26, 1846 – January 10, 1917) was born near La Claire, Iowa, but his family soon migrated to Canada. In 1853, they moved to Fort Leavenworth, Kansas Territory. When Cody’s father stood up at Rively’s store to give an anti-slavery speech, he was stabbed twice, and would have died had it not been for Rively, who jumped in and saved his life. Pro-slavers continuously threatened to kill Cody’s father, and in 1857, he died of complications acquired from his wounds. Cody, now 11, took odd jobs to help support his family. He worked as a wagon train courier, and claimed to have been a “Fifty’Niner” in Colorado. When the Civil War broke out, he joined Johnston’s Army as an unofficial scout in Utah Territory to quash a rumored rebellion by the Mormons in Salt Lake City. According to Cody’s memoirs, this was where he first started his career as an Indian fighter. At age 14, he became a rider for the Pony Express. In 1863, he enlisted with the 7th Kansas Cavalry as a teamster, and served as a Private in Company H until his discharge in 1865. In 1866, Cody married. The couple had four children, but three of them died in Rochester, New York. Cody began working as an Indian scout for the U.S. Army, and served as a scout for the highly publicized Grand Duke Alexei Alexandrovich of Russia’s royal hunt. Cody was awarded the Medal of Honor in 1872 for serving as a civilian scout, but in 1917, the rules were changed, and his award was revoked. (It was reinstated in 1989). In December, 1872, Cody and his friend, Texas Jack Oromoundo, traveled to Chicago to perform their debut, The Scouts of the Prairie. “Wild Bill” Hickok appeared with them the following year. The troupe toured for ten years. Cody claimed that he had once scalped a Cheyenne warrior, which was part of his act. He also claimed that he had been a trapper, a bullwhacker, a stagecoach driver, and a wagon master, but no documentation exists, and historians believe he might have fabricated these claims to gain publicity. Regardless, Cody’s colorful reputation grew. 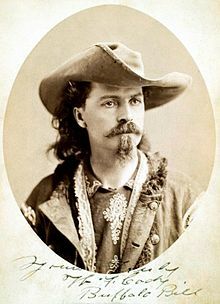 In 1883, he founded “Buffalo Bill’s Wild West” near North Platte, Nebraska. The circus-like show toured annually, and Cody met many dignitaries and heads of state. In 1893, he changed the name of his show to “Buffalo Bill’s Wild West and Congress of Rough Riders of the World.” Sitting Bull, Calamity Jane, and Annie Oakley appeared in the touring show, as did many diplomats from foreign countries. His show performed in such places as Madison Square Garden in New York City and the ancient Roman amphitheatre in Verona, Italy. In 1887, Cody performed a show for Queen Victoria, and in 1889, he met Pope Leo XIII. He wasn’t allowed into the Chicago World’s Fair of 1893, so he set up outside the fairgrounds and made a killing anyway. Between 1887 and 1906, Cody’s Wild West show toured Europe eight times. His shows gave Europe an authentic American experience, and insight into the fading American Western frontier. Cody was instrumental in founding a town named after him, and in 1895, Cody, Wyoming, near the east entrance of Yellowstone National Park, was founded. He established a ranch and hotel, and used his influence to persuade Congress to build a dam on the Shoshone River. Upon its completion in 1910, it was the largest dam in the world. In 1917, Cody died in Denver at his sister’s home. He was eulogized by George V, Kaiser Wilhelm II and President Woodrow Wilson. Cody is buried on Lookout Mountain in Golden, Colorado. At one point, Buffalo Bill was the most famous man in the world. He supported Native American Indian rights and women’s rights, and pushed for the end of hide-hunting and the start of hunting seasons. He was an activist, a conservationist, a humanitarian, and a remarkable performer. He saw his Wild West change drastically over the course of his lifetime, but left a significant historical impact on the world, and changed their perception of the Wild West forever. 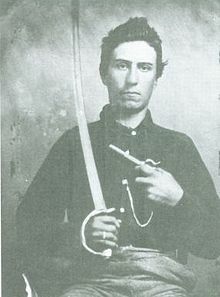 As a matter of coincidence, two interesting characters of the Old West were nicknamed “Texas Jack.” They might have even crossed paths during the Civil War. Both were from Virginia, and both fought under General J.E.B. Stuart. When John Wilson Vermillion (1842–1911) was asked why he was called “Texas Jack,” he said, “Because I’m from Virginia.” Jack was born in Russell County. He served in the Civil War, and fought for the Confederacy under J.E.B. Stuart. In 1865, he married an Indiana girl. They moved to Missouri, where he accepted a position as a territorial marshal. His wife, young son, and daughter all died in a diphtheria epidemic while Jack was away. Jack floated around the country, first to Dodge City, Kansas in the late 1870’s, and then to Tombstone, Arizona. He became friends with Wyatt Earp and Doc Holliday. On March 21, 1882, he participated in the Vendetta Posse that chased after members of the Cowboys following the death of Frank Stilwell. In 1882, he was back in Dodge City, where he killed a card cheat. Between 1883 and 1889, he acquired the nickname “Shoot-Your-Eye-Out Jack” Vermillion. In 1888, he joined the Soapy Smith gang in Denver, Colorado. He was involved in a train depot shootout in Pocatello, Idaho in August, 1889. Around 1890, Jack returned to Virginia, remarried, and had another son and daughter. There is confusion as to how Jack died. One source says he drowned in a lake near Chicago, but another says he died peacefully in his sleep. Family history records indicate that he killed a man in a shootout in 1890, and that he lived until 1911. John Baker Omohoudro (July 26, 1846 – June 28, 1880) had a completely different, but just as fascinating, story. He was also born in Virginia (near Palmyra). In his early teens, he traveled to Texas and became a cowboy. When the Civil War broke out, he was unable to join the Confederate Army because he was too young, so he enlisted as a courier and scout. Ironically, in 1864, he also enlisted under J.E.B. Stuart, and served as a courier and scout. After the war, Jack returned to Texas and resumed his life as a cowboy. He participated in the Chisholm Trail cattle drive, among others. It was during one of these drives that he acquired the nickname “Texas Jack.” He adopted a five-year-old boy whose parents had been killed by Indians, and named him Texas Jack Jr. In 1869, Jack moved to Cottonwood Springs, Nebraska. It was there that he met William F. “Buffalo Bill” Cody. The two participated in buffalo hunts and Indian skirmishes. They also acted as guides, and in 1872, Jack led a highly publicized royal hunt for the Grand Duke Alexei Alexandrovich of Russia. In December, 1872, Cody and Jack went to Chicago, where they premiered their show The Scouts of the Prairie. This was the very first Wild West show, and Jack was the first person to demonstrate roping techniques on the American Stage. 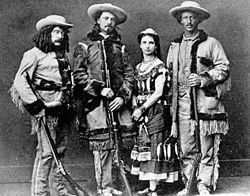 During the 1873-74 season, Jack and Cody invited their friend, James Butler “Wild Bill” Hickok, to join them in a stage presentation titled The Scouts of the Plains. When he wasn’t performing, Jack spent his time hunting on the Great Plains, and guided hunting parties for political figures and European nobility. In August, 1873, he married one of his co-stars, Giuseppina Morlacchi, from Italy. In 1877, he headed his own acting troupe in St. Louis. He also wrote articles for eastern newspapers and popular magazines, describing his adventures as a hunter and scout. His legend grew and was popularized in dime novels. In 1900, Jack was featured in a fictional series about the Confederacy, which was published in the Saturday Evening Post. Jack died of pneumonia in 1880. He is buried at Evergreen Cemetery in Leadville, Colorado. His son, Texas Jack Jr., carried on his father’s legacy by appearing in Wild West shows around the world. In 1980, the Texas Jack Association was established to promote and preserve his memory, and in 1994, he was inducted into the National Cowboy & Western Heritage Museum in the Hall of Great Western Performers.